Our company has been successful in winning appreciation from the clients as one of the most prominent names in the trading of Acrylic Enclosure. Being one of the renowned firms in the industry, we are offering Acrylic Enclosure. This easy to assemble case, manufactured from high quality thick acrylic, will provide your Raspberry Pi 2 and Raspberry Pi B+ quite good cover. Banking on our enriched industry experience, we are able to supply Acrylic Machine Enclosure. We are amongst the most reputed names in the industry, offering Acrylic Enclosure. In order to meet excellent quality standards, we are supplying Acrylic Enclosures. Backed by our vast industry experience we are able to offer Acrylic Enclosure. We are engaged in offering Acrylic Enclosure. 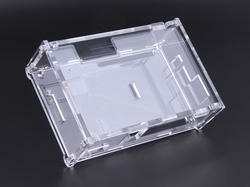 We make acrylic electronic enclosure for electronic kit.